As I grew to love Pickleball, I strived to become better. I took some lessons from Keith! Wow, what a great experience. He is such an knowledgeable player positive and so patient! He is a great coach with great ideas and makes Pickleball so much fun!! I found Keith and his instructive methods to be patient, supportive and challenging, with him knowing the right times to push and expect a higher level of play from me while also being able to halt play and repeatedly demonstrate for me a seemingly elusive skill. 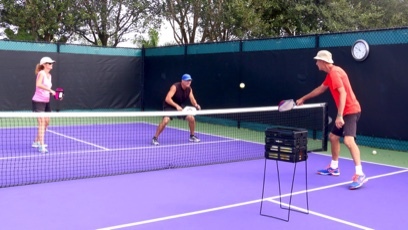 I found that my skills and on court play improved significantly under Keith’s tutelage. Coach Keith is a IPTPA rated 4.0 player and has won gold, silver & bronze medals in numerous tournaments. He is also an IPTPA ratings specialist for Australia and can give ratings test for 2.0, 2.5, 3.0, 3.5, 4.0 skill levels. 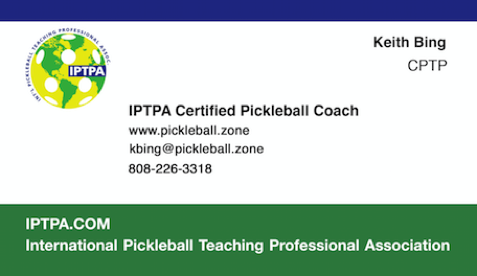 Learn the subtleties & etiquette of Pickleball. at their club, organization or community. There are various ratings systems, each open to a wide range of interpretation. The IPTPA ratings system is unique in that it tests pickleball skills and competitive play during a doubles contest on a pickleball court. K Bing was a successful and talented coach for more than 20 years, winning multiple championships in Europe. His coaching extended to training high school and college faculty in media production, internet research and software applications. Fot the past three years, he has been involved with all aspects of pickeball every day. Requires three or four players who want to have a ratings test for a specific rating. Example: Four players who want to take the 3.0 test.